This red 57 Chevy Bel-Air Club Car golf cart was looking awesome in Sun City Center with new custom seats, brush aluminum wheels, Chevy hub caps and a 6-shooter gun revolver for the suicide knob. 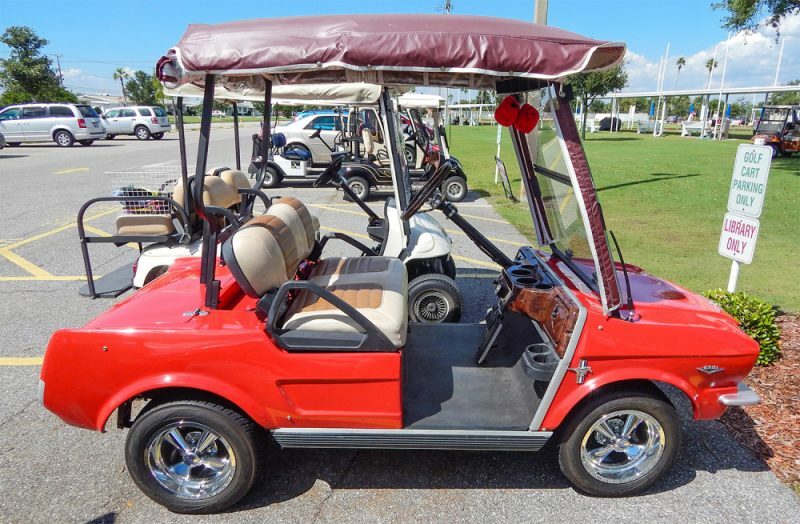 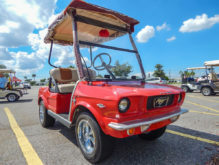 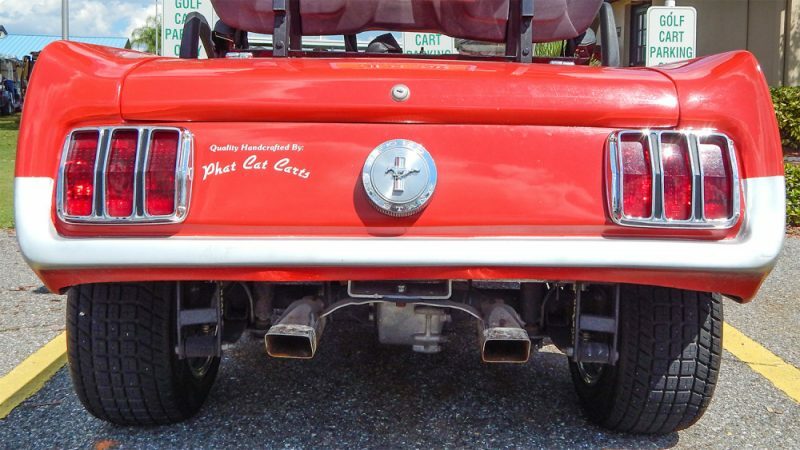 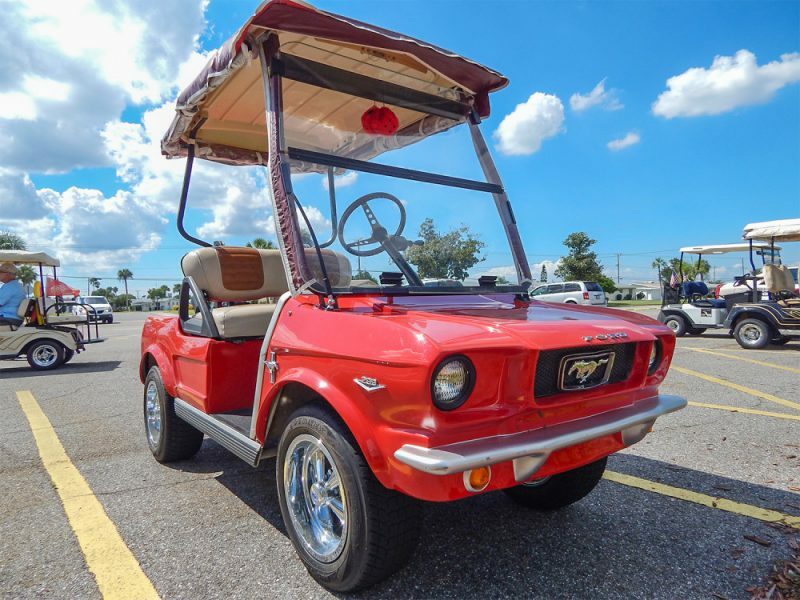 This flawless 1965 red Ford Mustang customized Club Car golf cart created by Phat Cat Carts came with chrome tail pipes and real Cragar wheels that were all-the-rage in the 60s. 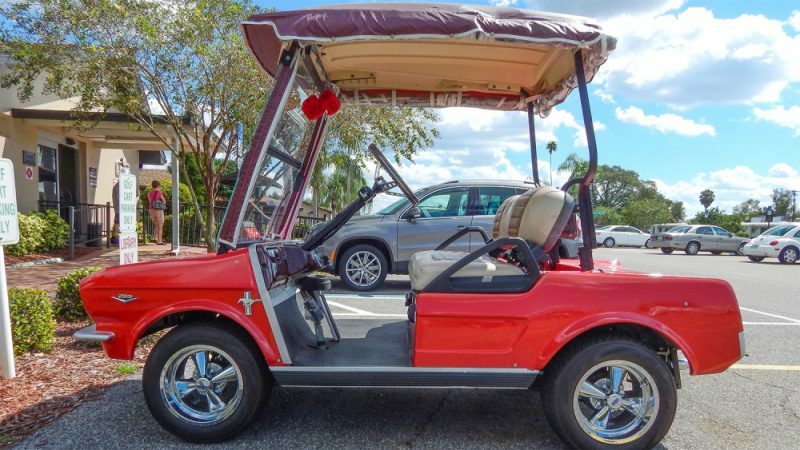 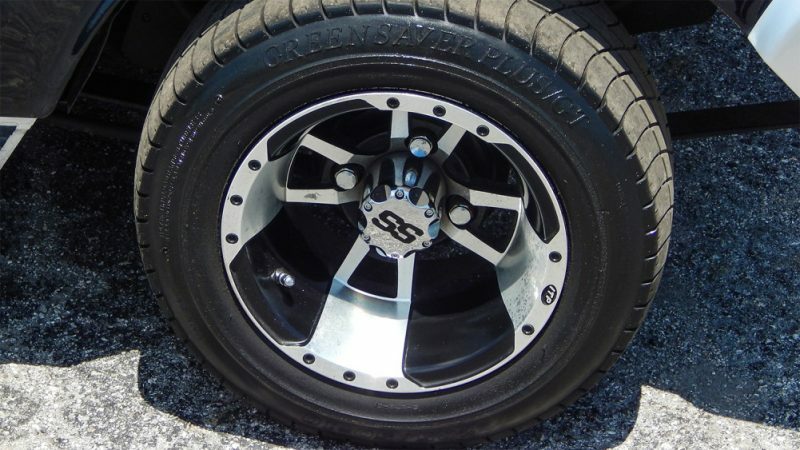 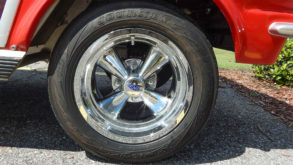 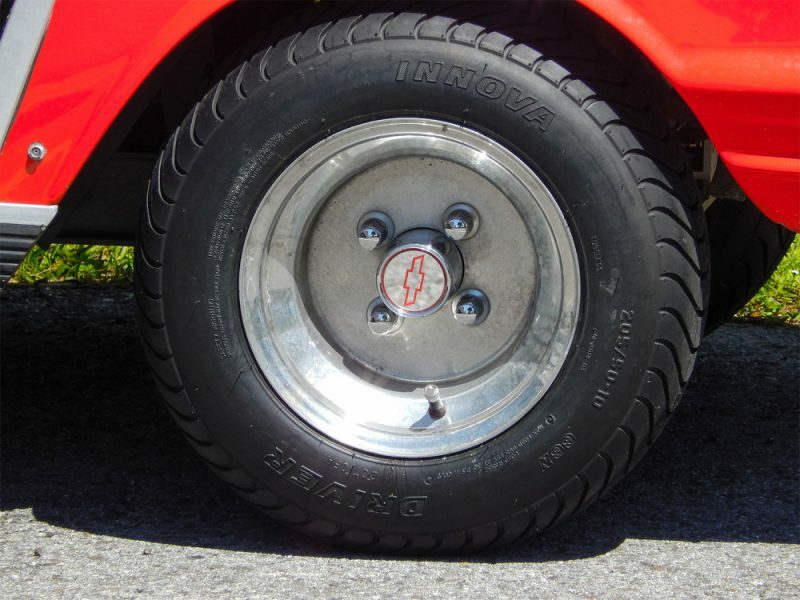 This cart sports authentic Ford Mustang pony emblems on the grille, right fender and steering wheel. 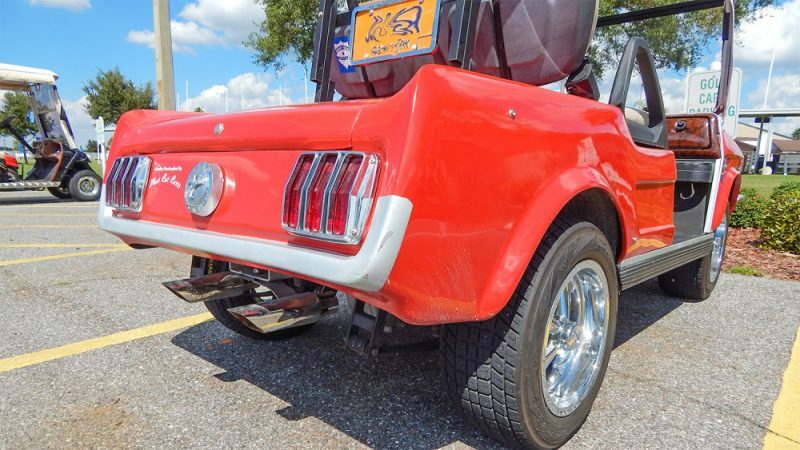 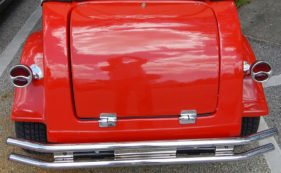 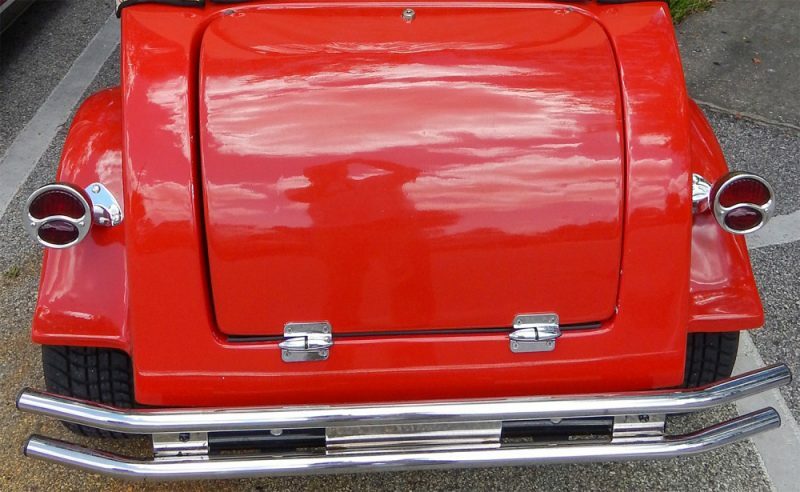 It even has a real Mustang gas cap along with original Mustang tail lights as well. 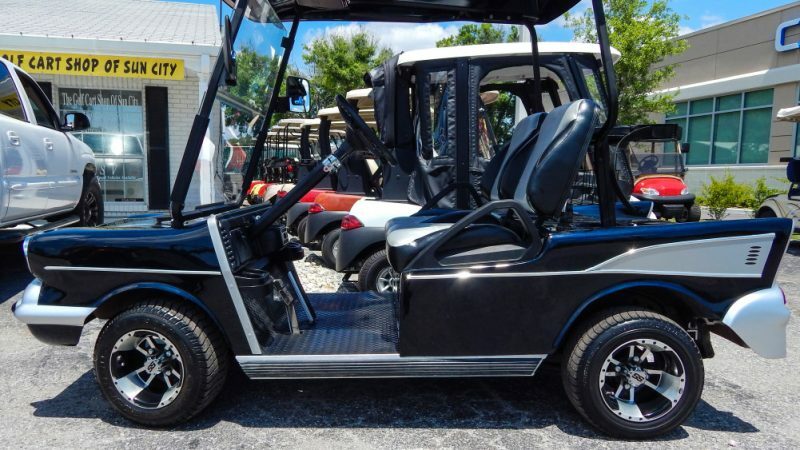 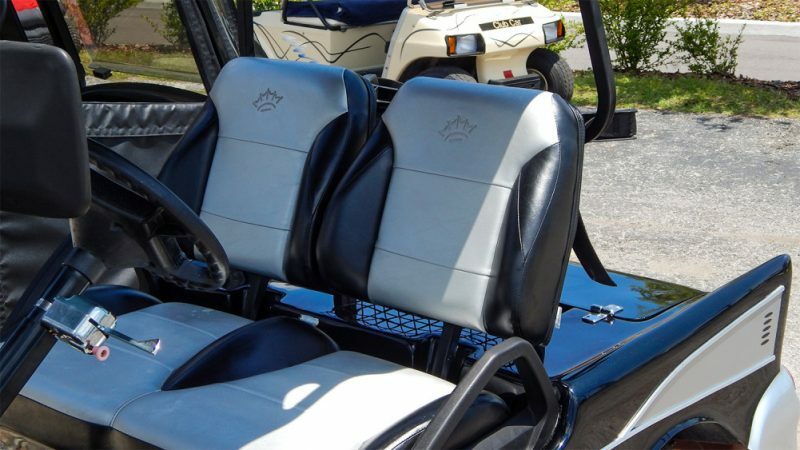 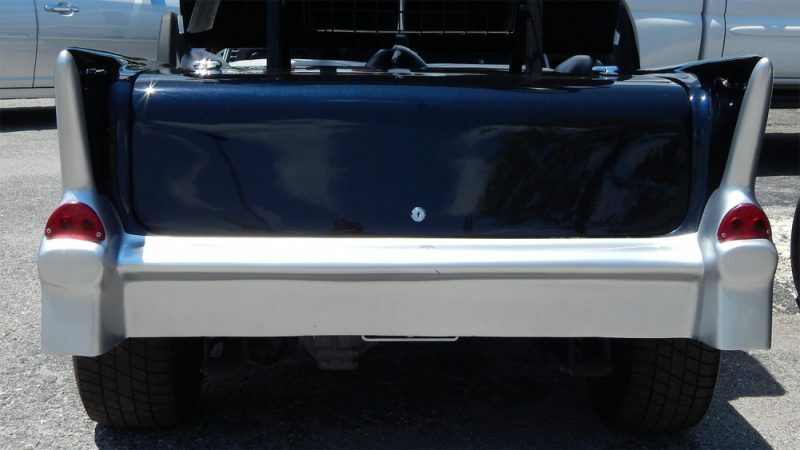 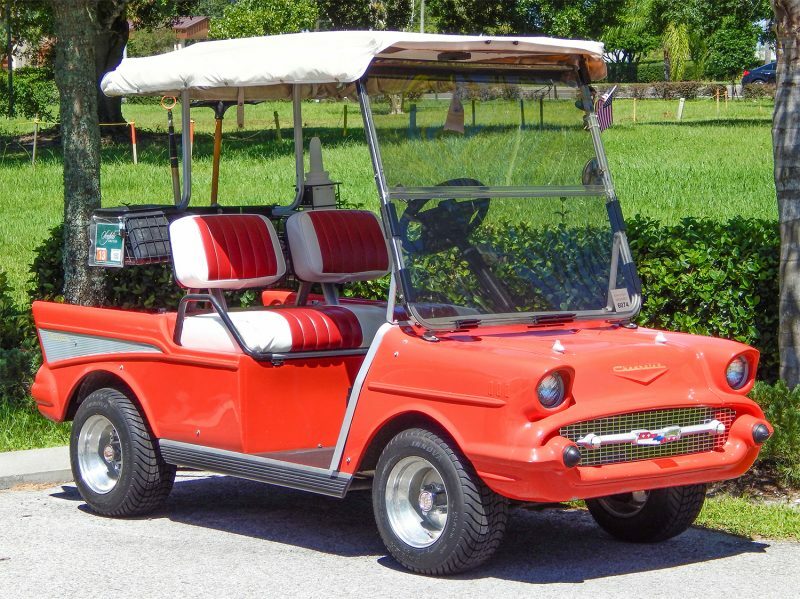 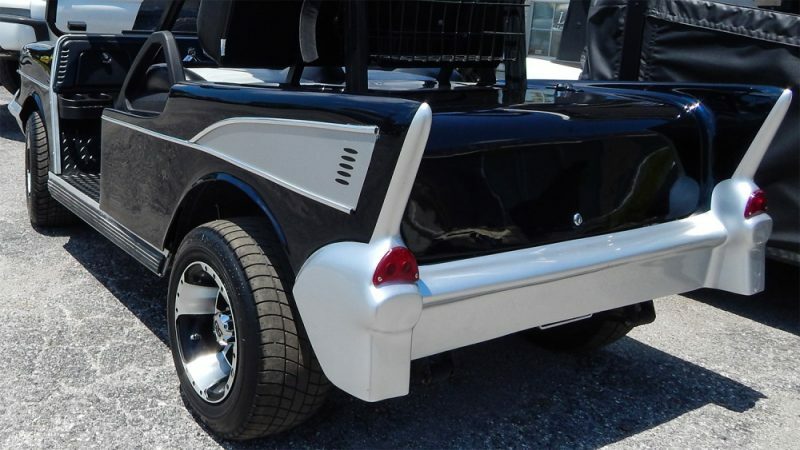 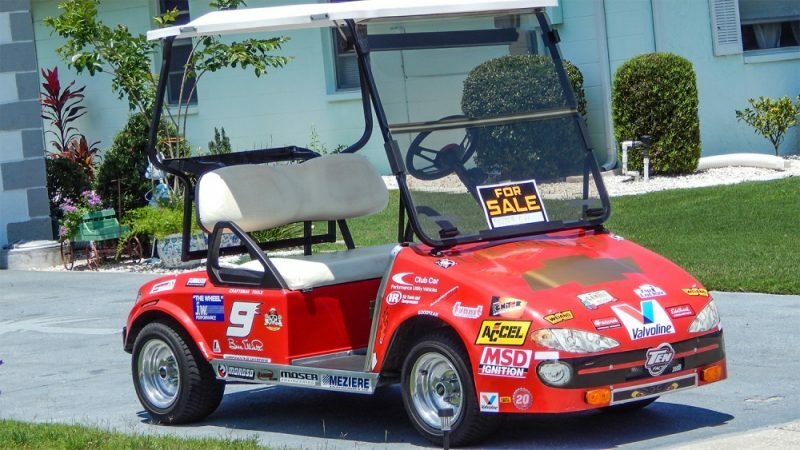 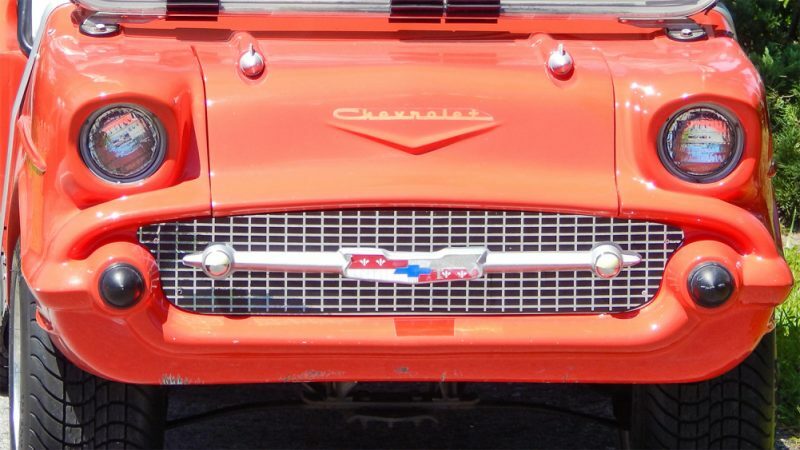 Phat Cat Carts manufacturers golf cart bodies like the 65 Mustang and the 2000 Nascar Monte Carlo in Clearwater that fit onto standard golf cart frames. 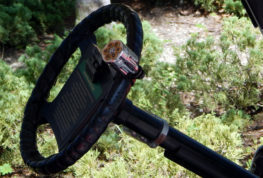 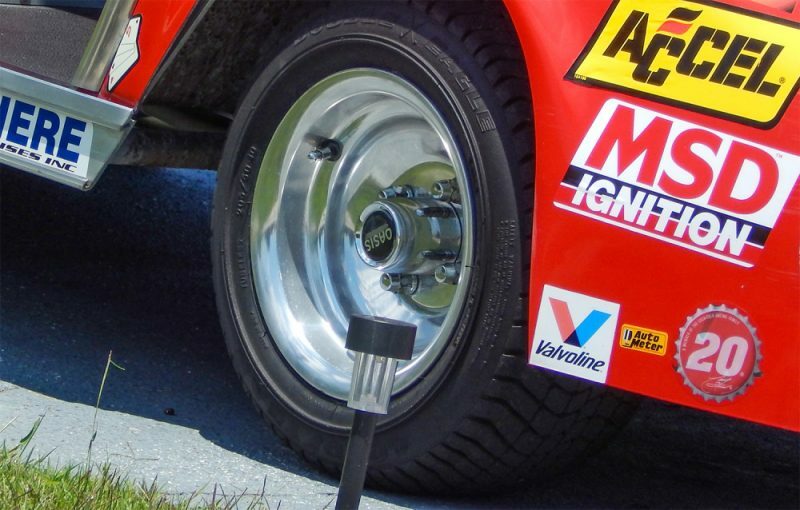 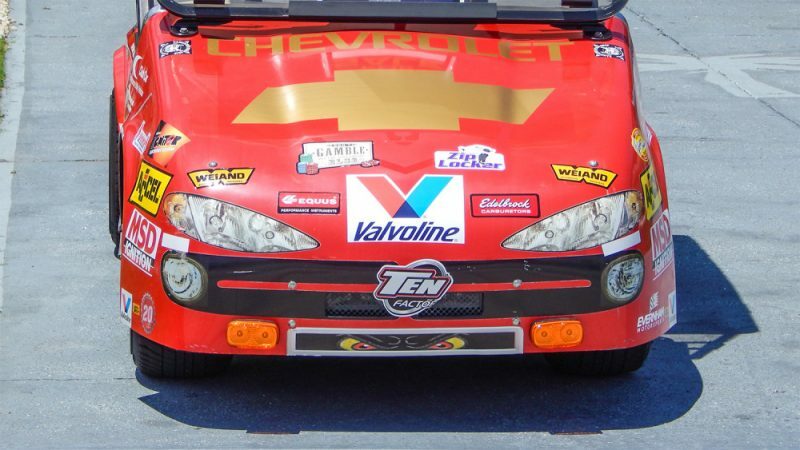 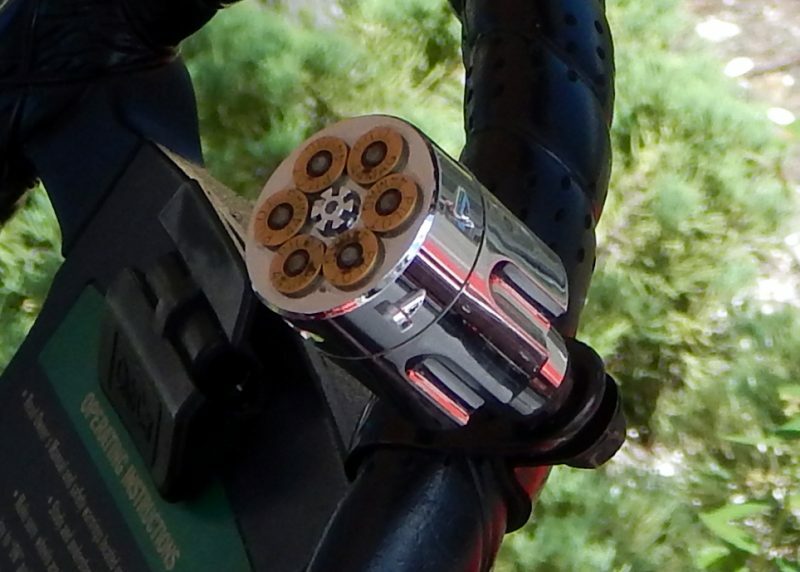 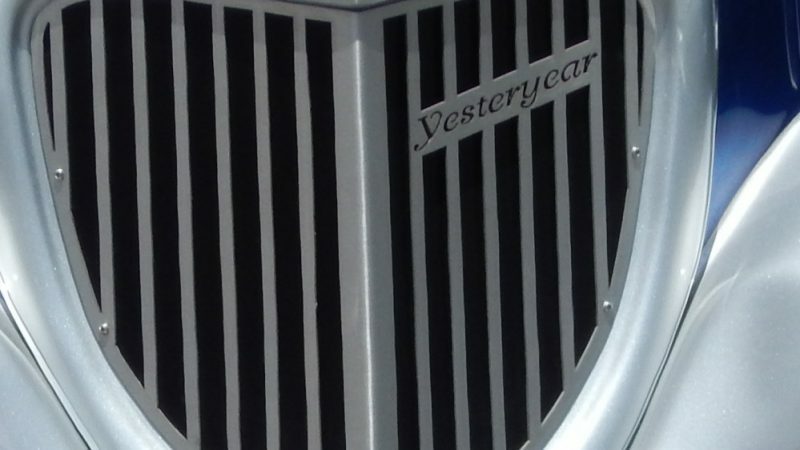 The company can use real car parts and copyrighted details due to having licensing agreements with certain automakers. 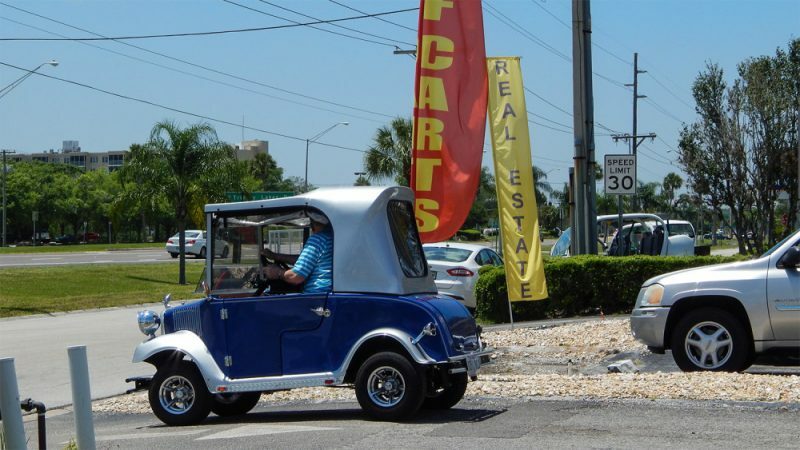 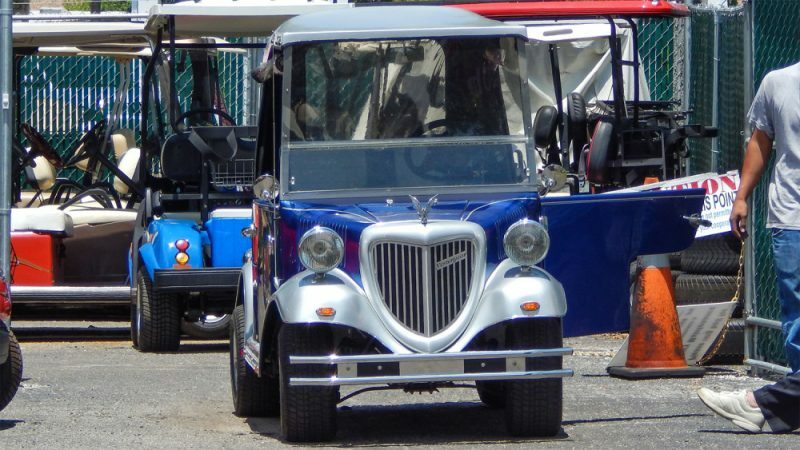 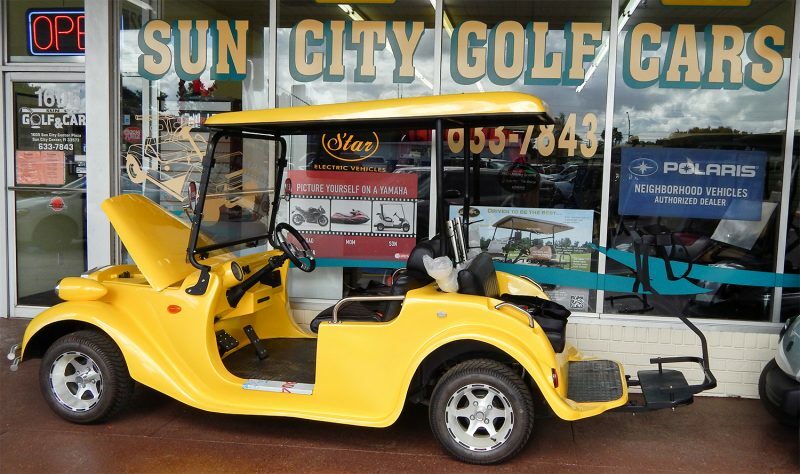 A blue Yesteryear golf cart stopped at The Golf Cart Shop of Sun City Center for some minor maintenance on a Friday afternoon. 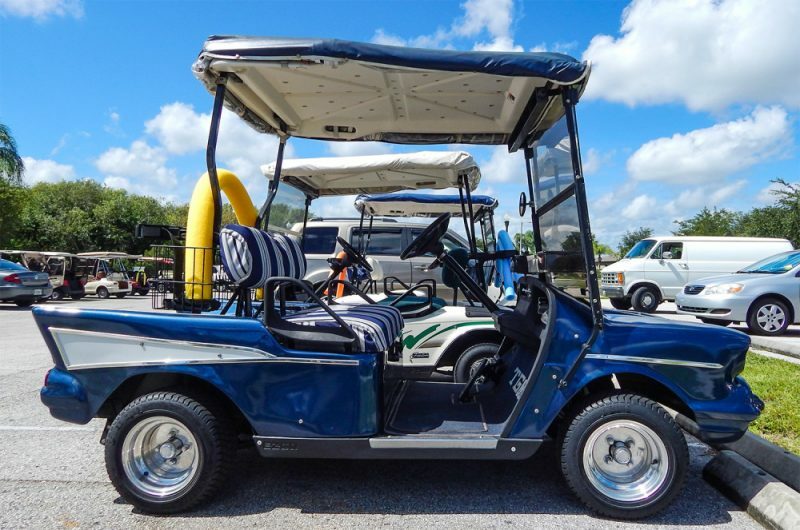 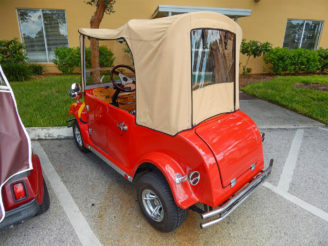 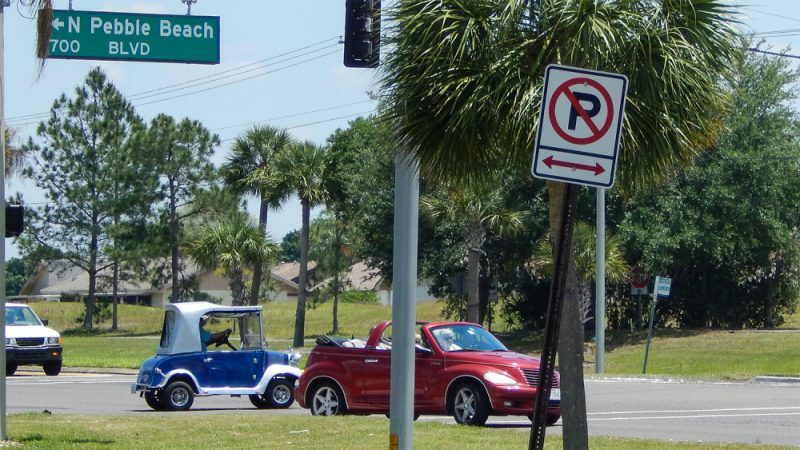 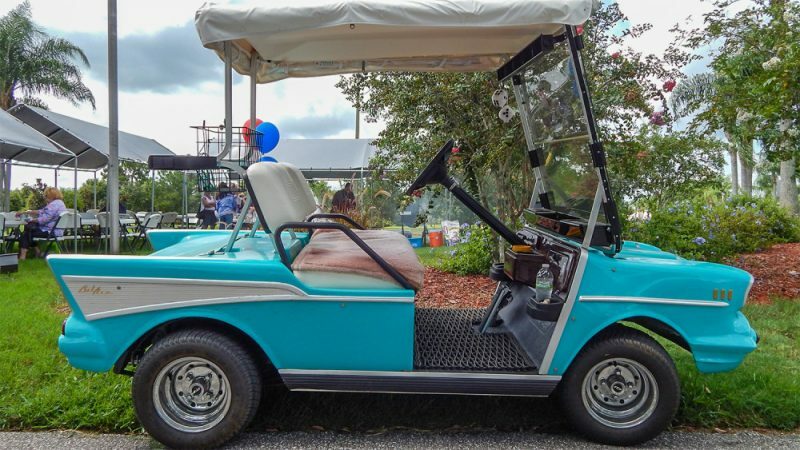 The 55+ golf-cart-friendly community allows carts to travel the same roads as cars – a much cheaper way to get around town. 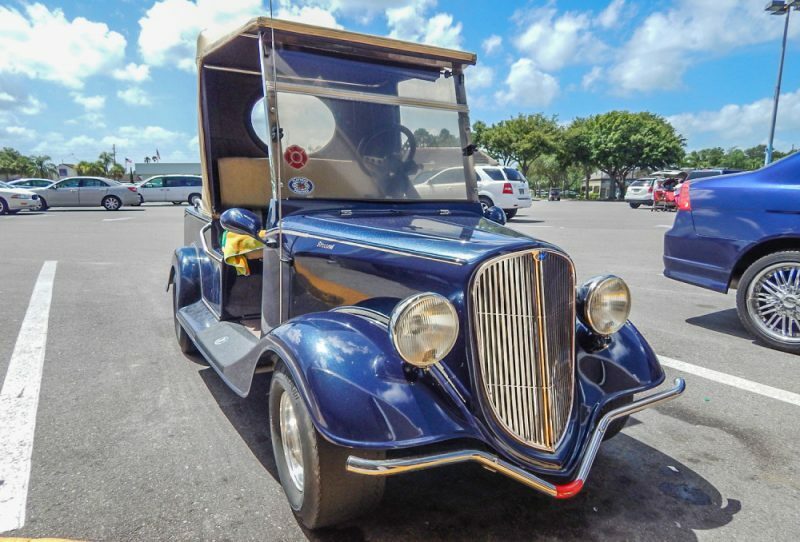 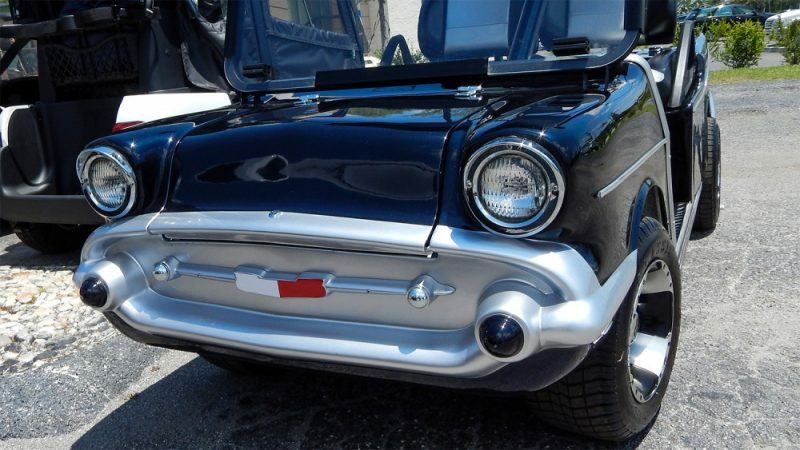 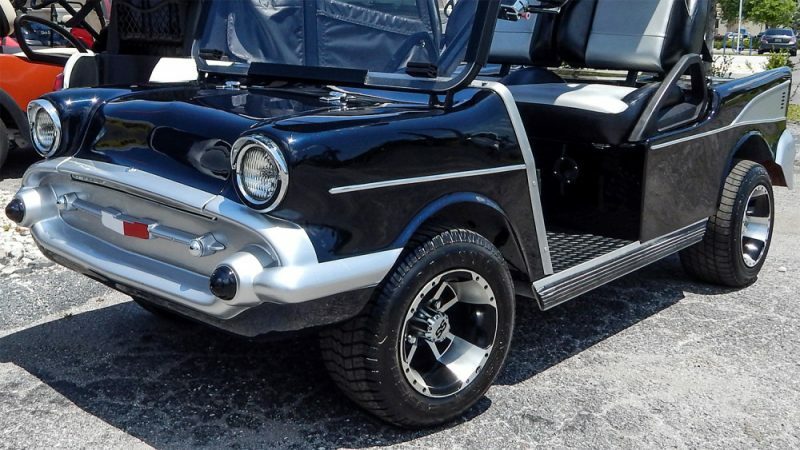 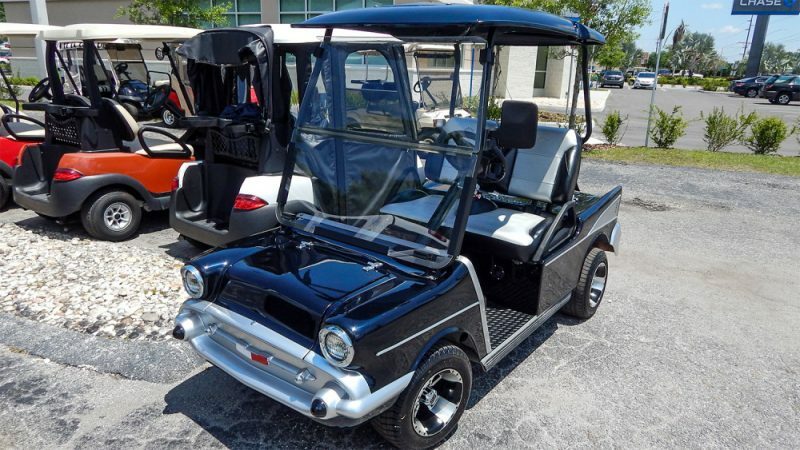 The new, black 57 Chevy Bel-Air Club Car golf cart with Green Saver Tires and SS ITP wheels was parked at the Sun City Center Golf Cart Shop on Rickenbacker Dr in Sun City Center FL. 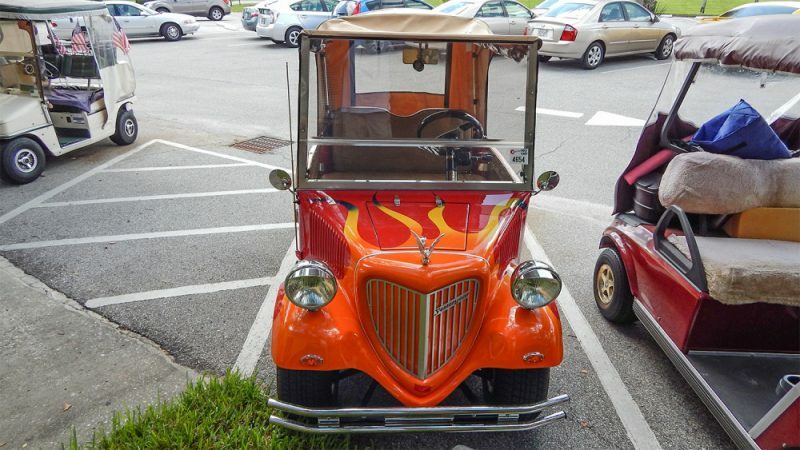 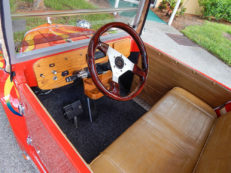 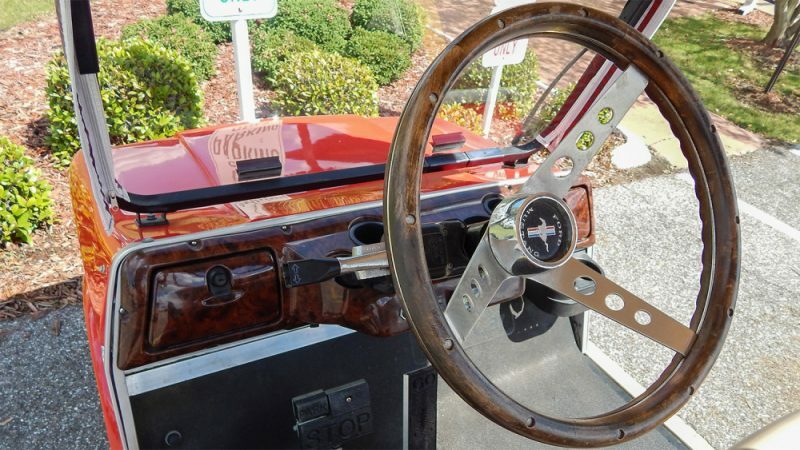 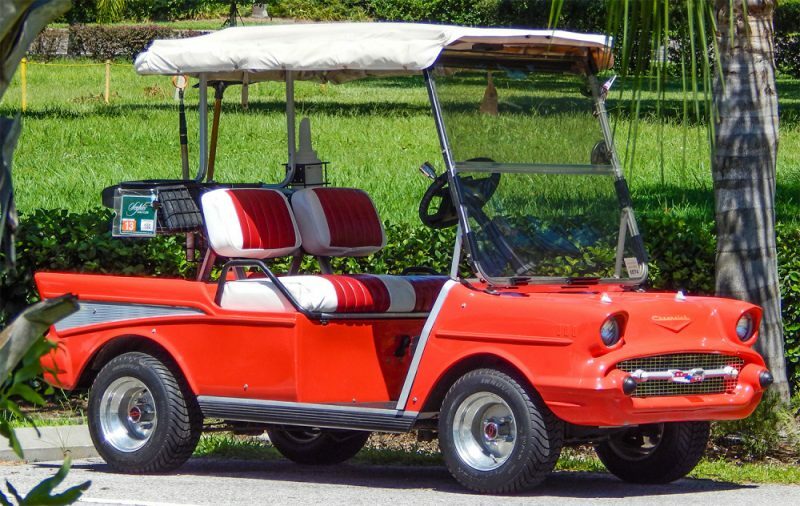 This flamed-out Yesteryear customized convertible golf cart is in showroom shape at all times. It It has chrome bumpers front and back, lockable hood and trunk and a woodgrain GT steering wheel. 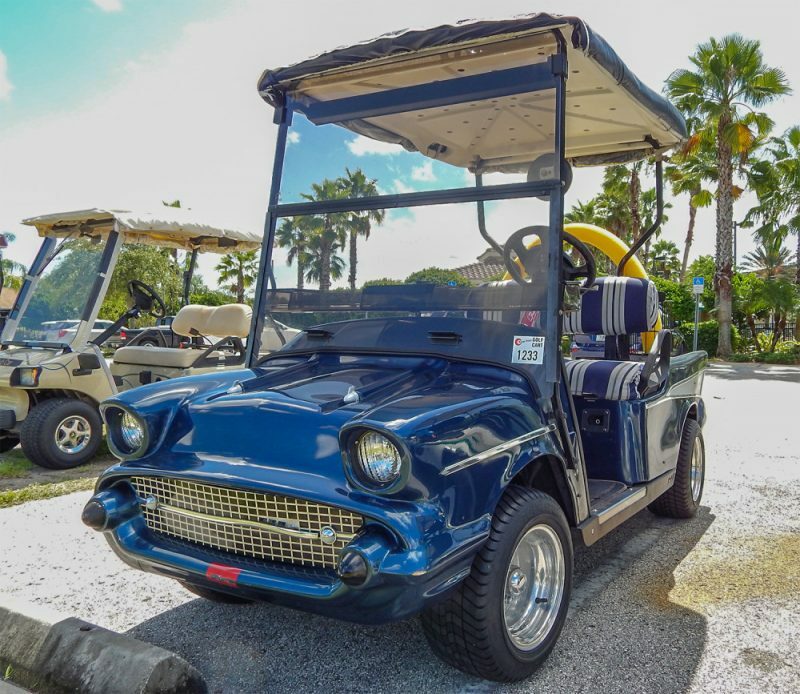 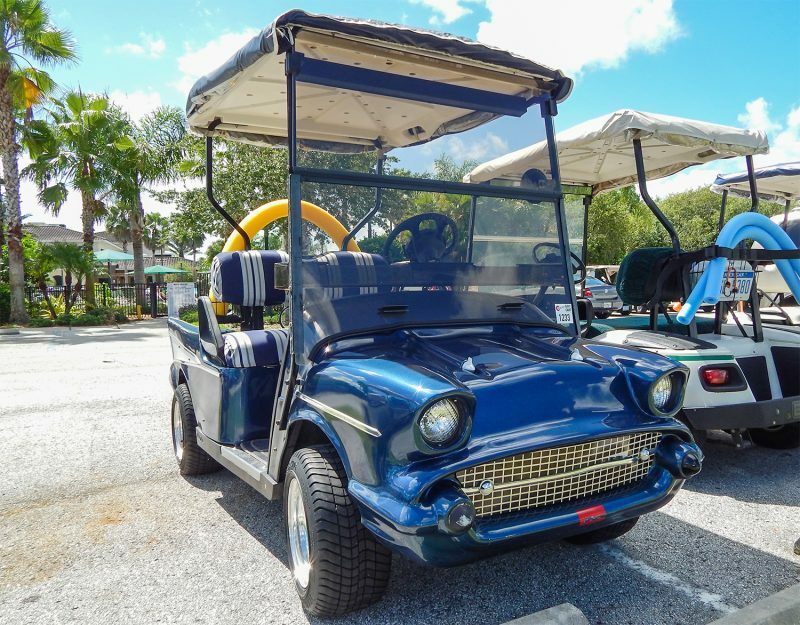 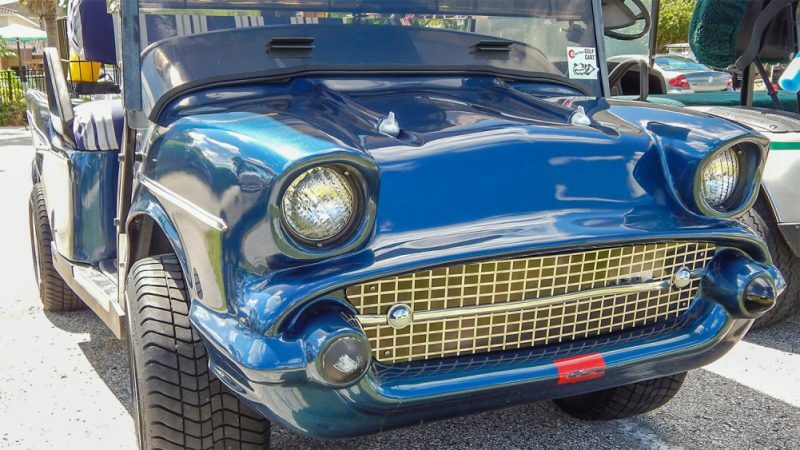 A classic dark blue 57 Chevy Bel-Air customized E-Z-GO golf cart visiting the Kings Point South Clubhouse in Sun City Center, FL. 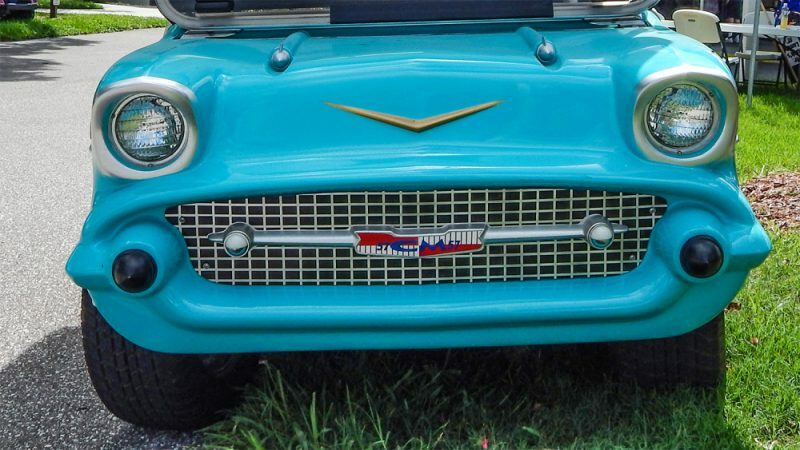 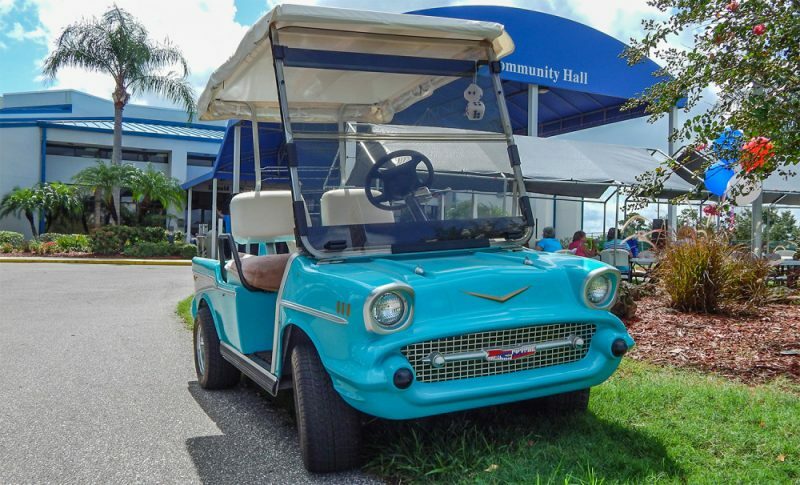 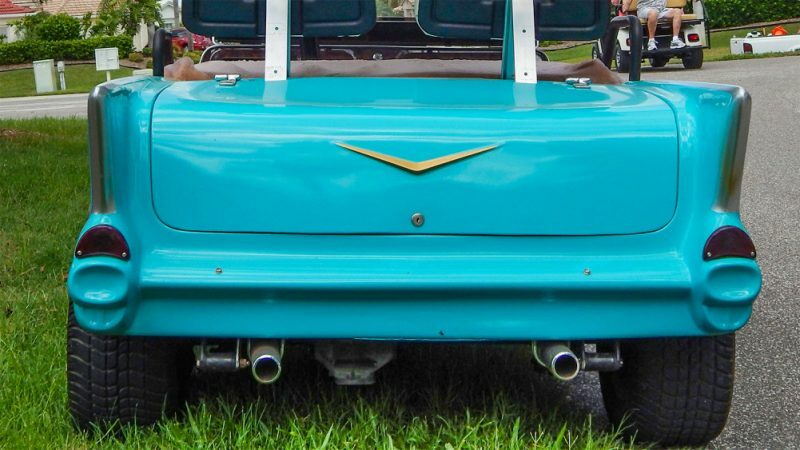 This nice looking light blue 57 Chevy Bel Air customized golf cart was parked in front of the Community Hall in Sun City Center, FL.